I am not sure how, but I completely missed the re-imagining of the series Battlestar Galactica (BSG) in 2003. None of my potential excuses make sense – Trek TNG was well done and over, I am sure I had a DVR in 03…nothing adds up. But I am glad I discovered it now. I just finished Season 2. I have no idea if the quality maintains, but so far the show’s gods have been good. For a space series it is surprisingly low tech. Production quality is fine, I mean the story and setting. There’s no beaming or phasers. The space setting is really just that – a setting. It’s more about complex religious metaphors, power struggles, classical government-military conflict, scary prescient cyber creatures that manipulate and kill humans, and a full range of human emotions that include guilt, jealousy, and human values. If you have not seen this series I recommend it. The first three episodes (the miniseries) sets the stage. It is important to watch the series in order. In 2012, I interviewed Avaya CTO David Chavez. He shared with me then that BSG was his favorite show ever. “When the show ended, the studio auctioned off most of the sets and set pieces. I was lucky enough to acquire the ‘Arrow of Apollo.’ I smile every time I see it.” At Enterprise Connect 2015, I caught-up with David and was eager to restart the conversation for this time I knew of said arrow – it first (and only?) appears in season 2. We discussed BSG, and I do believe it was my most technical conversation at the conference. David invited me to his home to watch a particular three episode arc. Turned out (who knew?) David lives about 15 minutes away. I get and respect fandom. I’ve attended ComicCons including the TNG reunion in Denver last year. I have a 7′ 1701-D poster in my office, a life size Picard, a uniform, and Batman photo autographed by Adam West. But my collection is nothing compared to David’s. The Arrow is on display in his living room like a museum piece. To get there one must walk past some 70 or so replica spacecraft from BSG, Trek and other shows – including Lost in Space. These ships share shelf real-estate with several Avaya and other awards. It was a very impressive exhibition that reminded me of the Trek Experience at the Las Vegas Hilton. A challenge for many collectors is the decision to open or keep items boxed. David solved this dilemma with a strategy of concurrence. 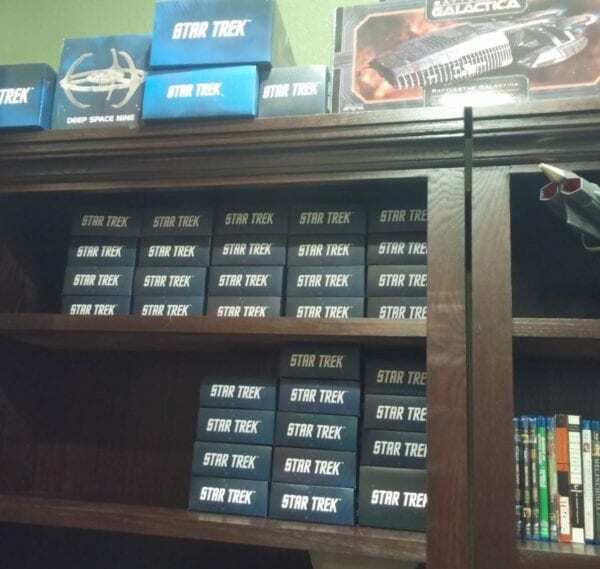 A bookshelf housed many unopened kits from multiple series. Of all the models, the most elaborate were of the Battlestars Galactica and Pegasus. These were one of-a-kind large mock-ups behind glass with impressive detail including markings and lights. My cell phone camera does not do justice. Prior to this trip I viewed most episodes on my PC. At David’s we enjoyed the Bluray discs up-scaled to a large 4k display with tremendous sound. The series was shot with HD cameras at 1080p. I have since been watching them on BluRay in my home theater at 1080 – there’s no going back. It’s fracking awesome. If you ever have a chance to meet with David, skip all the UC and network stuff and jump right to science fiction.